Heat transfer is an integral component in virtually all processes. Depending on the equipment usage requirements, heat exchangers, also called condensers, coolers, and boilers, can perform various functions. Heat exchangers made of inert, non-metallic materials are a requirement in the chemical and pharmaceutical industries where it is essential to avoid any interaction between the materials of construction and the substance being processed. In addition to chemical resistance there is a prime requirement for resistance to abrasion and ease of cleaning in equipment of this type. DDPS offers a wide range of shell and tube and glass coil heat exchangers and associated components to optimize your heat transfer requirements. 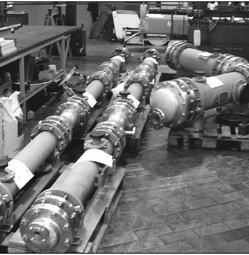 By providing us with the parameters of your process, our customer engineers can pinpoint the appropriate size and type of heat exchanger that is the optimal solution to your process requirements. Our heat exchangers are available as stand alone equipment or can be incorporated into a system. 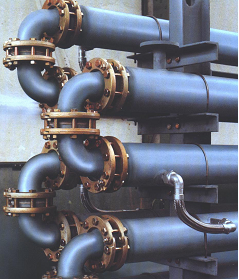 Shell and tube heat exchangers provide a versatile alternative to coil-type heat exchangers. 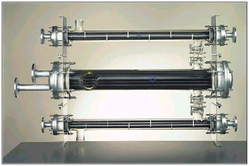 They were conceived as condensers, but they are equally suitable for heat transfer between two liquids or gases. The RBW series heat exchangers offers a range of capabilities to meet high-corrosion process needs effectively. It can cope with the most stringent demands for product purity, process versatility and ease of maintenance. The model RBW features individual tube seals, allowing an extremely reliable seal and simple replacement or plugging of tubes from the end. 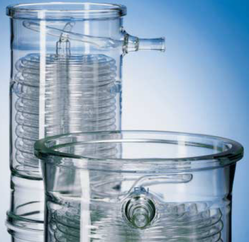 Standard units are equipped with a Borosilicate 3.3 shell, glass tubes, PTFE baffles, and individual tube seals. 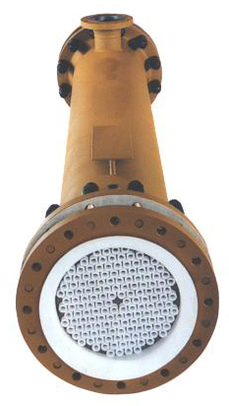 The EC-type exchanger is mainly used as a condenser. In conjunction with our reactors, it is possible to make up distillation ranges of any composition. Its design is plain and permits to achieve great exchange areas with a small bulk. The EC exchanger can also be designed to serve as a heater or an evaporator. The Model D offers a roster of capabilities to meet high-corrosion, high pressure, full vacuum, high temperature process needs effectively. It can cope with the most stringent demands for product purity, process versatility and ease of maintenance. At the heart of its toughness and versatility is a steel reinforced, glass filled PTFE tube sheet with individual tube rings for extremely reliable sealing and maintenance. Standard units are equipped with a carbon steel shell, glass tubes, PTFE baffles, and individual tube seals. The diffusion resistant Core-Therm tube plate with its integral support plate and the corrosion-resistant materials PFA and PTFE can be used at high pressures and also operated under vacuum. Silicon carbide heat exchange tubes meets all the requirements of an optimum HE tube because of its heat conductivity of 125 W/m²K and its high corrosion resistance. Constructed of glass-lined steel with silicon carbide tubes. Coil type heat exchangers are mainly used as condensers, coolers, or boilers. They can, however, be used for heat transfer between liquids and gases in general. 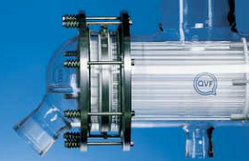 The coil heat exchanger design is based entirely on glass. The coil is fused to the shell. Units are supplied in various designs. No possible leak between the shell and the coil, making the design ideal for GMP applications. No possible metal contamination, yielding the highest product purity.